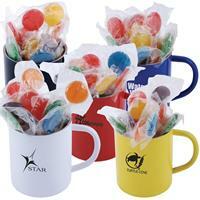 16 Assorted Lollipops packed in Double Wall Stainless Steel Coloured Barrel Mug. Mix of 6 great colours and flavours – Red (Strawberry), Yellow (Lemon), Blue (Tutti Frutti), Green (Lemon), Orange (Orange), Purple (Grape). Your choice of Black, Blue, Red, White or Yellow mugs. Individual white gift box. Finished weight = 257 grams per unit.